Surveillance video obtained by CTV News shows an Edmonton woman attempting to evade police in a Spruce Grove convenience store, by trying to climb into the ceiling panels, eventually crashing back into the store. 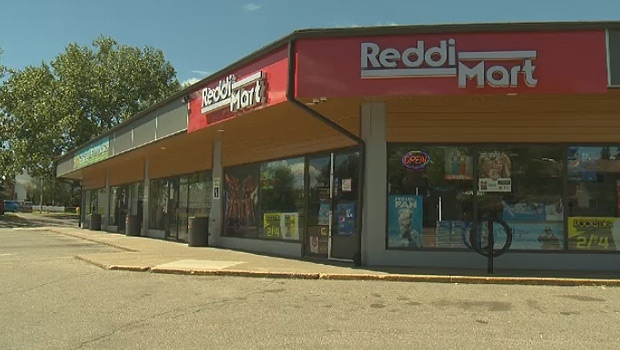 On Monday after 1:15 p.m., an RCMP officer was called to the Spruce Grove Reddi Mart after a man allegedly tried to make a purchase using stolen credit cards. Store owner Bhagwant Chauhan said he tried to buy a can of pop with the card. “My husband asked him if he can punch the PIN number, he said it’s not his card, it’s his girlfriend’s,” Chauhan said. Chauhan said the couple had been hanging around outside their store for hours before the incident. At the store, the officer tried to arrest the pair, but the man pushed the woman towards the officer and tried to escape. Surveillance video shows the man shoving the woman into the officer, who managed to grab and hold on to both of them – Chauhan’s husband tried to step in and help. “I’m very proud of him,” Chauhan said. The woman ran into the store’s back room, and video shows her climbing up, and then into the ceiling panels. A short time later, the woman fell through the ceiling tiles into the store, and she was quickly arrested. Meanwhile, the man resisted arrest, at one point throwing bags of snack food at the officer in the store. Eventually, after another brief struggle, he was taken into custody. “It was scary, you’re thinking the person is in the back but she’s up in the roof, thank god everybody is okay,” Chauhan said. Brittany Burke, 29, and Richard Pariseau, 28, both from Edmonton, were arrested and charged. Pariseau faces 11 charges, including possession of stolen property under $5,000, using a stolen credit card, resisting arrest and assaulting a police officer. Burke has been charged with obstructing a police officer, failure to comply with an undertaking and mischief. Police were called to the Spruce Grove Reddi Mart after 1 p.m. Monday, June 25, 2018.